Brownie Truffles. Just the thought of those two words together has you salivating a little...right? What's even better is that they are so easy to make! 1. So, you’ll need brownies...and well we have some pretty delicious ones. For this recipe, we'd recommend using the Double Chocolate Brownies. They take about 1-2 hours to defrost. 2. Once the brownies have defrosted, shape each one into a ball by rolling and pressing them between your palms. Now you can either coat your Brownie Truffles in milk chocolate 🤤 or cocoa powder 🤤 the choice is yours...both delicious and chocolatey alike! We'll show you how to do both. 3. For coated Brownie Truffles: Tip the 2 packs of Milk Chocolate Buttons into a microwaveable dish, heat in 10-second intervals, stirring after each until the chocolate has melted through - it will look silky smooth. Err on the side of caution that the chocolate doesn't melt or else it'll get all bitty. 4. Now for the fun bit! Use a fork to dip the brownie balls into the melted chocolate - make sure they're coated all the way around. Place them on a lined baking tray with some grease-proof paper and let them set for 15 minutes. 5. 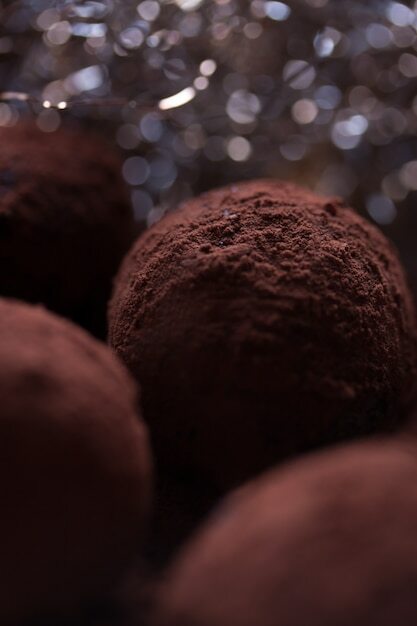 For powdered Brownie Truffles: Roll the brownie balls into the cocoa powder to get an even covering. Place them on a lined baking tray with some grease-proof paper and let them set for 10 minutes. 6. Consume right away, you've earnt it! If not store in an airtight container and store at room temperature. Brownie truffles are easy, quick and most importantly, delicious!